As anticipated, the real estate market across the top 7 cities in Q3 2018 stayed subdued. The quarter saw a meagre 3% increase in the overall fresh housing supply as against the preceding quarter. These new launches were largely dominated by the lower-budget segment (< Rs. 40 lakh) with nearly 42% of the total new supply. 33% launches were in the mid segment (Rs. 40-80 lakh) and the remaining 25% in the luxury and ultra-luxury segments. The third quarter of the year is usually a lull period due to the 15-day shraddh period, which is considered inauspicious for buying property. Consequently, builders keep new projects on hold for the ensuing festive season beginning early October. In terms of purchases, there was a slight increase of 9% during the Q3 as compared to Q2 2018 across the top 7 cities of India. This indicates that even though home buyers’ sentiments are positive, many continue to wait and watch. The top 7 cities (NCR, MMR, Chennai, Bengaluru, Pune, Kolkata and Hyderabad) saw 52,150 new units launched in Q3 2018. This is a notable increase over the 50,600 units in Q2 2018. The cities contributing most to new unit additions in Q3 2018 include MMR, Pune, Bengaluru, and Chennai. Together, these three cities accounted for 76% of the new supply. Kolkata saw the launch of nearly 4,050 This is a significant rise of 59% from Q2 2018, and an increase of more than 500% from Q3 2017. Bengaluru added 7,175 units, a quarterly decrease of 18%. Interestingly, this is the only city which has the maximum supply of units (nearly 55%) in the mid segment (Rs. 40-80 Lakh) other than lower-budget housing launches. Developers’ focus on completing existing projects rather than launching new ones aligns with the current market sentiment. ANAROCK’s Real Estate Consumer Outlook Survey underscores that, to the backdrop of stalled or delayed projects, only 5% prospective buyers are looking to buy homes in new projects. 49% prefer to buy ready-to-move-in properties, and 46% prefer projects that will complete within a year. 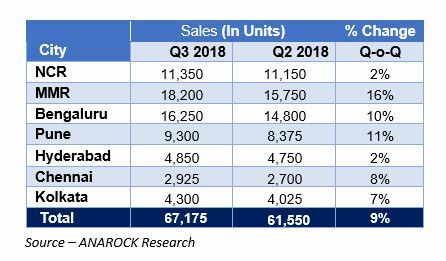 Nearly 67,175 units were sold in Q3 2018 with NCR, MMR, Bengaluru and Pune together accounting for 82% of the overall sales. Bengalurusales rose by 10% (from 14,800 units in Q2 2018 to 16,250 units in Q3 2018). Kolkatasales increased by 7% (from 4,025 units in Q2 2018 to 4,300 units in Q3 2018). Despite the ongoing pain in Indian real estate, both housing sales and new launches have increased q-o-q. The future depends on a favourable macroeconomic environment in 2019.